MENOMONEE FALLS, Wis., March 20, 2019 /PRNewswire/ -- One in two Americans are willing to ante up more cash at businesses that have clean, well-maintained restrooms, according to the 10th Annual Healthy Hand Washing Survey by Bradley Corp. The number of those who will "definitely" or "probably" spend more money has hiked up seven points to 52% this year compared to 45% in 2018. In fact, clean restrooms are so desirable that one in three Americans say they'd pay to use a restroom if they were assured it was clean and well-stocked. "Consistently, over the 10 years of our survey, a large majority of Americans say they expect a high quality business to have a high quality restroom," said Jon Dommisse, director of strategy and corporate development for Bradley Corp. "So, when a customer encounters a messy restroom, their perception of that business and its products and services are tarnished. Even worse, 55% are unlikely to return to a business after a bad restroom experience, which can have a devastating effect on sales." "On the flip side, well-maintained restrooms attract customers who reward those businesses with increased spending. It simply makes good business sense to keep restrooms clean and modern-looking so customers come back." "Nearly 60% of Americans tell us that, on average, they use public restrooms anywhere from one to five times per week, and an additional 21% use restrooms six or more times a week," Dommisse said. "In all, 80% of people regularly use public restrooms. As odd as it may sound, for many of us, public restrooms are an important part of our everyday lives." Despite visiting restrooms regularly, Americans report an increasingly high degree of aggravation with them. Their top aggravations include toilets that are clogged or not flushed (85%), empty or jammed toilet paper dispensers (83%), and partition doors that don't latch (78%). In all, nearly 70% of Americans reported having an unpleasant restroom experience. "Based on these pain points, it makes sense that American's top requests for improvements are keeping restrooms cleaner and better stocked," Dommisse said. 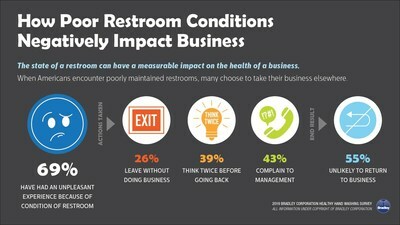 "The state of a restroom can have a measurable effect on the health of a business. Our aim for this research over the past 10 years has been to understand hand washing habits and help businesses improve their restrooms and attract repeat customers." For over 95 years, Bradleyhas created the most complete and advanced commercial washrooms and comprehensive solutions that make industrial environments safe. Bradley is the industry's leading source for multi-function hand washing and drying fixtures, accessories, partitions, solid plastic lockers, as well as emergency safety fixtures and electric tankless heaters for industrial applications. Headquartered in Menomonee Falls, Wis., USA, Bradley serves commercial, institutional and industrial building markets worldwide. For more information visit https://www.bradleycorp.com.